Forbes’ efforts to assign some order to our petty human envy continues with its list of the highest-paid men in entertainment, just one of the magazine’s near-weekly rankings of wealthy and famous people along arbitrarily chosen lines. Today that line involves rich and famous penises, and when it comes to rich and famous penises, naturally Tyler Perry is on top. 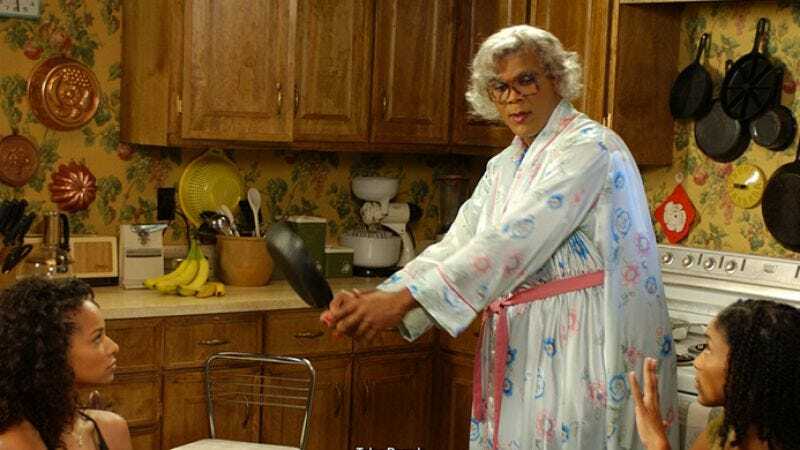 Between May 2010 and May 2011, Tyler Perry made approximately $130 million through the various frying pan-wielding arms of Tyler Perry’s sass manufacturing plant, putting Tyler Perry well ahead of even noted franchise operators such as Jerry Bruckheimer ($113 million) and Steven Spielberg ($107 million). Heavily contributing to Tyler Perry’s earnings were the five movies he’s made since 2009—as of press time, anyway; check your local listings—plus his two TV series, as well what we can only presume is the half-cent royalty he earns every time the words “Tyler Perry” are uttered, which by our estimates added up to well over $100,000.